Clearsounds CSC600ER CarePhone is an amplified SOS alert telephone enables you to make a call for help when you cannot reach a phone and, when the call is answered, you and the other person can hear one another over its amplified speaker. When you need help, simply press the button on the wireless pendant you are wearing. The CSC600ER senses the wireless signal and automatically does the dialing for you. It calls the first person the phone has listed as an emergency contact for you, such as a family member, friend or neighbor. If that person does not answer, or the line is busy, it automatically calls the second person in your pre-programmed list. The CSC600ER continues dialing up to 5 numbers until somebody answers. If nobody answers, it starts over again and tries them all a second time. When the phone reaches a live person, it plays your pre-recorded emergency message. The other person presses a number (0-9) to confirm that the emergency message has been received and to deactivate the phone from dialing the next emergency contact number. 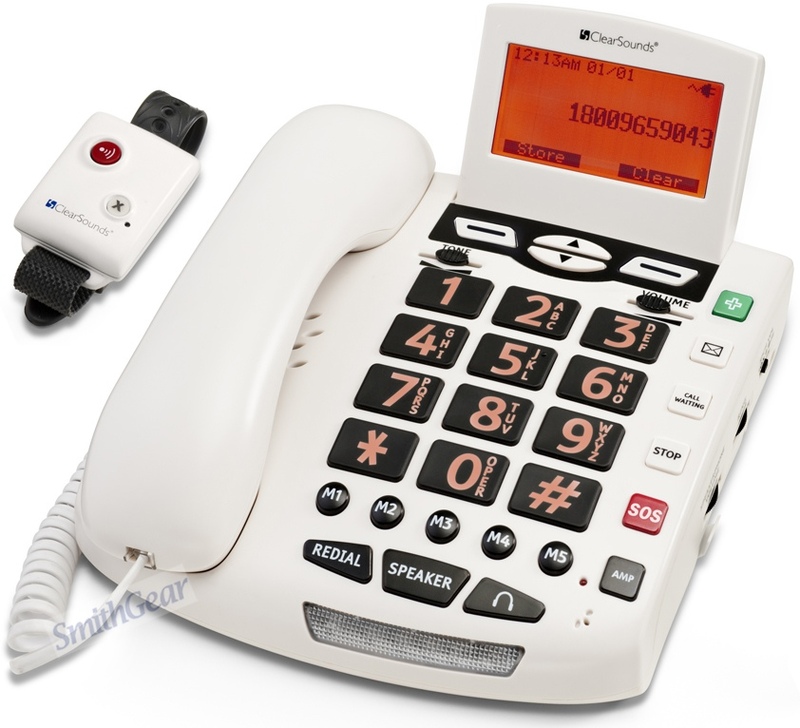 The CSC600ER then turns on its speakerphone so that the emergency contact is able to speak and listen to the other user. - Dimensions: 7.75" x 7.5" x 1.75"
Clearsounds Extra/Replacement Remote Pendant for the CSC600ER - The SOS button on the pendant will activate SOS emergency dialing. You can also can use a pendant to answer any incoming call, on speakerphone, remotely.